In the previous essay, I explained why an examination of politics, organisation and power was necessary in understanding how Singapore could respond to issues in the second half of the twenty-first century. In this second part, I’ll lay out the considerations behind looking at these three issues, and present scenarios based on the line of thought. There definitely are other ways to examine POP, but for my purposes here, I will examine two broad themes: 1. The flow of ideas and 2. The location of power. I find thinking about these two themes useful, although in future writings I might explore other themes. Again, because I’m looking at a large expanse of time (50 years – SG100), I can afford to play around with possibilities. Scenario planning is a technique used by large organisations to tell stories about the future – about how events in the future could unfold in non-linear ways. Shell popularized the approach; the National Intelligence Council of the US publishes scenario reports every 4-5 years. This report, now in its 5th iteration spanning almost 25 years now, is watched closely. Of course every technique has its strengths and weaknesses, but the point here is to invite further discussions – make things accessible to a wide audience to have a good discussion. The things discussed here could certainly lead to conversations on other topics. The scenario analysis here will certainly not be exhaustive or comprehensive – it’s meant to be exploratory. I’m also bending the rules a bit with scenario planning. A formal use of the scenario process focuses on what is called, “contextual issues/trends” – trends for which there is little scope of influence. The discussion here focuses on social participation and politics, for which some limited influence by citizens is possible. However, because of the exploratory nature of this discussion, and from the individual perspective, these things could be considered ‘contextual’ – it is difficult for a single individual to influence these trends (unless the individual is highly influential, which most of us aren’t). One way to think about the political-social interactions is to think in terms of the flow of ideas. How do ideas flow from society to politics? If the flow of ideas is restricted between different groups in society, I would characterise that configuration as ‘disciplined’. I consider to the current society to be ‘disciplined’ in this regard. If the flow of ideas is more un-restrained, then we approach an ‘open’ model, where ideas are more free from the restraints of censorship. 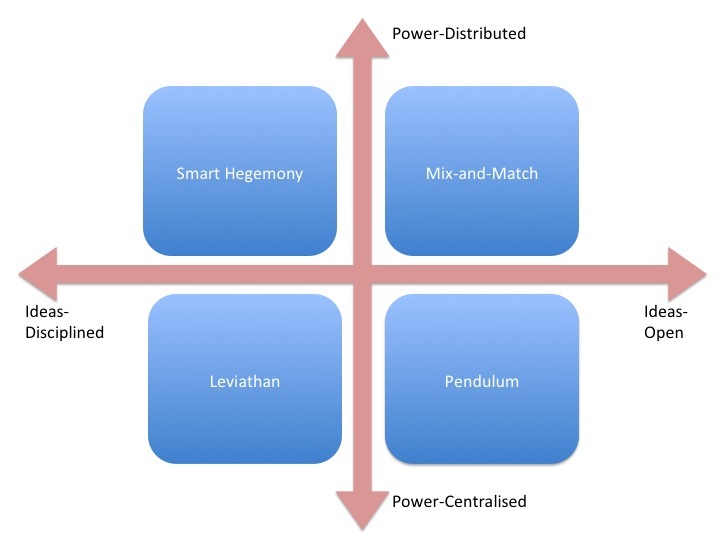 The other set of considerations, and similar to the first, is how will power be concentrated? Today, the truly important decisions, and the locus of decision, resides in the Cabinet, and with the Public Service. This is a very centralised form of decision-making. Information flows up and down within the hierarchy of the public service, and important pieces of information make their way to the Cabinet. And similarly, when it comes to planning. Social groups today often have to organise themselves to interact with the Public Service, although increasingly so they might have some access to the Cabinet, but in any case, the Cabinet almost always retains the final say, and charges the public service with the execution. In contrast to the current centralised system, a more distributed configuration of power structures would provide social groups with more autonomy in executing social goals, with minimal oversight from public agencies. One could envision more empowered town councils, and civil society groups charged with the execution and responsibility of certain policies, for instance. I admit in the current context today, this distributed-manner of power structures is difficult to foresee in the near future, but given the long stretch of time I’m considering, this might not seem so radical yet. 2. Whether the distribution of decisions and influence remain limited to a central authority or if it is more distributed or diffused across multiple groups in society. Status quo – centralisation through bureaucratic control; groups have to engage with the bureaucracy to gain legitimacy. Smart Hegemony – political party participate actively in various groups in society and influence decision-making there. Coalition politics; vibrant civic scene; characterised by local autonomy; possibly at the expense of global coordination; has high degree of resilience. Alternating political pendulum. There is a certain predictability in what happens as political parties rotate in and out of power. In Smart Hegemony, the party in power distributes power to social groups. This could take the form of MPs (regardless of political party) sitting on the board of directors of effective NGOs with a view of shaping their decisions. In the Pendulum arrangement, parties and their associated social groups rotate in and out of power. The policy emphases change as a result. What could happen in this instance is an inevitable cycling in and out of public servants in tandem with the political masters. We see a bit of this with Australia’s government, where a previous administration established a climate change-related unit, only for the unit to be removed under a different political party. Policies follow politics, not the only way around. And in the Mix-and-Match system, what happens could be said to resemble politics of conveniences – different parties and different civil society groups coalesce to form coalitions of convenience with no ideological emphasis. This situation could result greater local participation in politics possibly at the expense of coordination. However in this situation, there can also be much resilience when dealing with crisis. How might these changes come about? What about political changes, and how might they come about? Ho Kwon Ping has gone through this terrain quite thoroughly in his lecture on politics, and there is little to add here. From Ho Kwon Ping’s talk, there really are just a few possibilities: that the Opposition parties consolidate; or the PAP could split, although as Ho Kwon Ping himself said that the kinds of deeply divisive issues that could split the party is just not foreseeable. How will power structures in society change? Current grassroots groups might eventually grow in influence, attract funding and become the organisational bases for formal political power. People might begin to realise that real change in their lives come about because of persistent work over a specific issue with the government. They could either join existing groups that are already effective and trusted by the bureaucracy, or they could undertake the difficult work of doing it for themselves. Current effective groups might become complacent and lose members to a rival or upstart groups. I am making a significant assumption here: that people will be willing to invest their time and effort in volunteering for causes. If this assumption does not work out, then the centralised way of information flows would apply, since that it also the best way to ensure that issues are being reviewed and acted on. The different kinds of social and political arrangements will have many implications for us. Each of these socio-political arrangements requires different sets of skills to navigate around. As individuals, little actions can still accumulate to become large changes, but this process will take time. Those of us who are still impatient should take a step back and learn more about intra- and inter- organisational dynamics before stepping into the fray. As an observer looking at the proceedings of the SG50 celebrations, I’m curious that there has not yet been any discussion about the future. There are understandable reasons for the absence of both the youth voice and discussions about the future, and I’ll definitely be interested in how those conversations will play out. The reason I think, is straightforward. The atmosphere around SG50 is in a reflective phase – one that looks back at the past and celebrates the efforts of the pioneers in building this country. Certainly there is much to celebrate about, and yes, the efforts of the pioneers need to be honoured. More than that, this past – of hard work and ruggedness, gives us – the present, their future – the symbolic resources we can draw on in times of difficulty. This history that we have gives us the confidence, that no matter how difficult the future can be, we have the ability to pull through and better yet flourish. One of the ways there can be a serious discussion on the country’s future is to be educated about organisations, power and politics. Before we understand all the other issues, we have to understand the nature of politics in Singapore, who are the organisations involved, and how they wield their power. Knowing how power is used in Singapore gives us a starting point in thinking about how to wield it responsibly, and to use it to tackle all the other issues that will affect us in the second half of the twenty-first century. And there are many. Climate change will be one – it’s effects will be global, and it will affect other countries, which in turn, will affect us. Technological change will continue, bringing about large changes in our lives, and especially in the world of work and jobs. For Singapore to continue flourishing, what matters is how we will take on these changes – and for that understanding how power, organisations, and politics will matter. We often don’t make an explicit connection among power, organisations and politics together. We do make connections between politics and power – the common-sense understanding is that politics is the exercise of power. We often make the connection between organizations and politics – in the sense of the common ‘office politics’ that happens. Sometimes we think of organizations as exercising power – how different organizations fight for influence. Maybe this is intuitive when we think of political parties as organizations, or when we think of companies fighting for market share – the companies with a dominant market share could be said to have a lot of power in the industry. It’s how we think of Wal-Mart, or the oligopolism that happens in many industries. Power is relational – it does not make sense ‘on its own’ It requires at least two people – one acting on power, and the other being acted upon. It is neither good nor bad; it just is, and it can definitely be used in either way. With this we can discuss power relations in a family, in institutional settings, in community groups, in politics, and across different countries. Organisations can be defined as groups of people acting together for a common purpose. They might be doing a whole bunch of different things, but those different things are largely in the pursuit of goals. These goals could be, as with the military – to be able to end a war quickly; to get individuals or families out of crises. Organisations are also concentrations of power – an organisation is more influential if it can achieve its goals and exert itself on other actors. As a result, most organisations are also involved in some kind of politics – be it within organisations or with other social actors. Of course, internally, people are participating in politics – going around trying to influence other people within the organisation to get their own goals accomplished, within the larger framework of the organisation’s goals. All that is clear – that politics and power is all around us. It’s better that we see it for what it is and learn to be responsible about it, so that we understand ourselves and our actions better. Understanding power, for example helps in understand the relationship dynamics within a couple, or a family, or within the office, and so on. This framework helps us understand the behaviour of some groups of people relative to others. The use of power is focused in organisations, and it is through organisations that people’s collective energies can be harnessed. Power has a visible component – the influence and the behaviour. When geopolitical analysts measure military power, they usually take a look at the military hardware – the ships, the tanks, the planes, and so on. When political pundits look at how political leaders use their power, they look at how they influence lawmakers through speeches and negotiation – persuasion. Economic power can be visible when people start talking about funding, aid, market access, and so on. Power also works through other means. One of the most difficult ways to identity power’s operations when it becomes part of our lives – when it becomes the default setting for how we live. When that happens, it becomes difficult to tell of power’s influence, yet it is there. Notions such as “way of life” allude to such influences. That the “way of life” is often taken for granted, and not thoroughly examined would be an example of how a collection of actors have shaped our lives. That is not to say that we are all puppets being manipulated – we remain free to choose how we want to live our lives, but that our options are constrained. Another example is the ‘choice’ of consumer products that we experience in supermarkets. The reality is that consumer companies are trying to manipulate our buying choices through visions of attractive people and what they wear/eat/use. Again, the logic here is that it’s not that people are being manipulated like puppets; its just that the bulk of our attention would fall on particular products and particular brands, and might be attracted to purchase specific products. If nothing else, the points above just aims to illustrate that there are obvious and non-obvious ways of how power operates, and we have to pay attention to both, or even pay close attention to the latter, since they are harder to call out. We want to pay attention to power because of the way it influences our lives, especially if we want to be aware of the choice and power that we have too, as citizens and consumers trying to do the right thing for ourselves and for others. All of us are choosing something, even if we appear to be doing nothing. In a way, living the default is to support existing power structures. This is why asking for a change in the power structures is tiring and difficult. When people are habitualised into supporting an existing power structure and ways of life, asking others to change it is almost the equivalent of changing a habit – and habits of course, are very difficult to change. Asking others to change the assumptions they don’t usually question is tiring – for both the person advocating for it, and for the person being asked to change it. Social change, as a result, is very difficult, and often doesn’t last. When people don’t have the patience or don’t see the point of doing something different, very often they fall back to what they knew before – and hence reversions do happen. When politicians advocate for change, and do so inspiringly, be cynical. I guess this is why Obama was so exciting and now, so disappointing. Promising change and acting on them are obviously two very different things, especially when the resistance to change can be so high. So dramatic changes don’t work, and can be dangerous. What works are, no surprise – small incremental steps, pursued consistently over time, or moderately sized changes pursued during crises and gradually maintained and added on. The difficulty with this is with sustaining the effort over time. That’s why crises are significant – they provide legitimacy for change-advocates to say that current directions don’t work, and people rally around the need for change, and willing to change their habits. What happens after the moment of crisis, is something else. I’ve introduced how organisations, power and politics are linked together, and I’ve shown how power is both obvious and non-obvious. I’ve also described a little about how power and politics relate to organisational change. Very broadly speaking, these notions of power are important in discussing how social and political changes might happen, how people might participate in power structure, and what to watch out for to tell if things are changing in any particular direction. All of these will help us to think more clearly about the dynamics that will shape Singapore’s future.